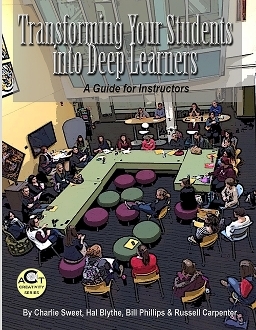 Transforming Your Students into Deep Learners: A Guide for Instructors is intended as a follow-up to Achieving Excellence in Teaching: A Self-help Guide (2014). In Chapter Three of the latter, the authors posited deep learning the major goal of higher education. This book elaborates on the concept of deep learning and offers a rationale for why K-12 students have difficulty with college teaching—overcoming the learning gap. To help concerned instructors instill deep learning in their students, the book provides the Excellent Eight, specific strategies based on recent research and experience. Hal Blythe, Ph.D. (University of Louisville, 1972), is the Co-Director of the Teaching & Learning Center at Eastern Kentucky University. With Charlie, he has collaborated on over 1200 published works, including 17 books (eight in New Forums’ popular It Works For Me Series), literary criticism, and educational research. Charlie Sweet, Ph.D. (Florida State University, 1970), is the Co-Director of the Teaching & Learning Center at Eastern Kentucky University. With Hal, he has collaborated on over 1200 published works, including 17 books, literary criticism, educational research, and ghostwriter of the lead novella for the Mike Shayne Mystery Magazine. Russell Carpenter, Ph.D. (University of Central Florida, 2009), directs the Noel Studio for Academic Creativity and Minor in Applied Creative Thinking at Eastern Kentucky University where he is also Assistant Professor of English. He is the author or editor of several recent books including The Routledge Reader on Writing Centers and New Media (with Sohui Lee), Cases on Higher Education Spaces, Teaching Applied Creative Thinking (with Charlie Sweet, Hal Blythe, and Shawn Apostel), and the Introduction to Applied Creative Thinking (with Charlie Sweet and Hal Blythe). He serves as President of the Southeastern Writing Center Association and Past Chair of the National Association of Communication Centers.